The Vietnam War was a long-lasting conflict in Southeast Asia. It started after World War II and ended in 1975. More than one million Vietnamese soldiers and over 50,000 Americans were killed in the war. It also cost the lives of over two million civilians . Before World War II the French controlled most of Indochina, today’s Laos, Cambodia and Vietnam. After Japan had lost the war left the country in 1945 the French wanted to take control of Vietnam again. When China became a Communist country in 1949, Communist influence in Vietnam became stronger too. A nationalist leader, Ho Chi Minh, declared Vietnam an independent country. Soon afterwards a war between Ho Chi Minh’s followers and the French began. It ended after the French had lost an important battle at Dien Bien Phu. The French were forced out of the country and Vietnam was divided . The Communists controlled the northern part and those who still supported the French controlled South Vietnam. The government in the south was weak and more and more people turned against it. Communist rebels started coming in from the north. They were trained and armed by North Vietnam and called themselves Vietcong. During the Cold War America fought Communism in many places around the world. US presidents promised to help countries that were threatened by Communism. They thought that if they let Communists take over the southern part of Vietnam other countries in the region would become Communist too. This was called the “ Domino Theory ”. President John F. Kennedy saw this danger and started sending military advisers to help the South Vietnamese army. After an American warship was attacked off the coast of North Vietnam Kennedy’s successor , Lyndon Johnson started sending ground troops to southeast Asia. In the following years more and more American soldiers were sent to fight the Vietcong and the North Vietnamese army. By 1968, the US had half a million troops in the country. The United States bombed highways, bridges, railroads and cities in North Vietnam, as well as the Ho Chi Minh trail , a route that led from North Vietnam through Laos and Cambodia to the south. Vietcong guerrillas received supplies and weapons from the north along this route. The Americans thought that they would win the war quickly because they had modern weapons . They relied on their firepower and bombs to stop Communist aggression. On the other side the North Vietnamese and Vietcong led a completely different war. They could move faster than the Americans and used guerrilla tactics, attacking American troops by surprise. This was new to American soldiers because they never knew where the enemy really was. The Vietcong also knew the jungle better and got used to moving around in such a difficult terrain . At first Americans at home thought it was a good idea to stop Communism. They supported American involvement . As time went on and more and more American soldiers got killed in Vietnam Americans changed their attitudes about the war. People saw the brutal war on television. Anti-war protests spread throughout the country. Americans believed Vietnam was a place they did not belong in. Towards the end of the 1960s the Vietcong and North Vietnam started attacking the south on a larger scale . Under pressure from the public at home the American government changed its policy . President Lyndon Johnson started withdrawing troops and peace talks began in Paris. When Richard Nixon became president American bombing of Vietnamese hiding places in neighbouring Laos and Cambodia become even more intense . On the other side he continued bringing more and more troops back home. By this time, Americans at home mostly opposed the war . In 1973 North Vietnam, South Vietnam, the United States and the Vietcong signed a peace agreement . However it was not kept. The North Vietnamese army and the Vietcong pushed further to the south. They met little resistance because South Vietnam’s army was too weak and couldn't fight alone. Thousands of civilians fled from the oncoming enemies. In 1975 Communist troops entered Saigon and the South Vietnamese surrendered . The war was officially over in 1976. North and South Vietnam were reunited under a Communist government . Saigon was renamed Ho Chi Minh City. The Vietnam war was a brutal war with many casualties . Many civilians lost their lives and millions became refugees . Much of North Vietnam was destroyed by American bombs. Chemicals used to clear the jungle destroyed much of the land permanently . After the war the North Vietnamese put many Southerners into prison . As a result over a million civilians fled South Vietnam. 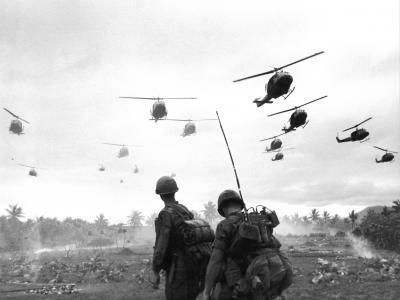 The Vietnam War also changed the United States’ role in the world. It was the first war that the Americans had lost. Soldiers who came back suffered from psychological problems and had a hard time returning to normal life. While men who came home from World War I and II were seen as heroes , those who came home from Vietnam were seen as losers. Četba v angličtině - The Vietnam War. Perfektní způsob, jak si rozšířit slovní zásobu je číst články v angličtině. Zkuste anglický text o válce ve Vietnamu.